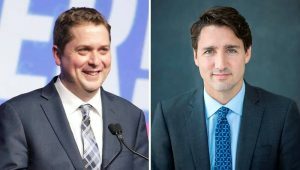 CONSERVATIVE Party Leader Andrew Scheer on Tuesday slammed Prime Minister Justin Trudeau for saying that low-income Canadians don’t pay taxes. Scheer said: “For the last several days, Conservatives have made a convincing argument that Justin Trudeau will raise taxes if he’s re-elected in October. Today, he made that point even more clear. Well sure everyone pays GST but most low income citizens are eligible for the GST rebates. Trudeau was referring to INCOME tax only and tax breaks do not benefit anyone earning less than that magic 11,809 amount. I know from experience. So scheer is just trying to make political points by fudging what was said to fit his agenda.